Delhi building collapse Live updates: Arvind Kejriwal visited the hospital to see the condition of the injured. Kejriwal has ordered a magisterial inquiry into the incident and said the government will provide compensation to the victims. Five people were killed, including four children in the Ashok Vihar area tragedy. Delhi Chief Minister Arvind Kejriwal on Wednesday visited a hospital here to meet the victims of Ashok Vihar building collapse that occurred earlier today. The CM met the injured people and enquired about their condition. Meanwhile, CM Kejriwal has ordered a magisterial inquiry into the incident and assured the victims that compensation will be provided to them by the city government. “I have ordered magisterial probe in the matter. The Delhi government will also give compensation to the kin of deceased and injured,” he said. Blaming MCD for the tragedy, he said it was the duty of the civic body to assess the condition of the building, which it did not perform. “Municipal corporation has the responsibility of safety of buildings…they will have to keep their system in order…they (MCDs) will have to strictly enforce their law,” he told reporters. Earlier today in a shocking incident, five people were killed, including four children, and at least seven injured after a four-storied building collapsed in Delhi’s Ashok Vihar Phase 3 area, causing panic in this northwest area of the national capital today morning. According to reports, the rescue operation is underway and six fire tenders are engaged in the relief and rescue operation near Sawan park. A call about the incident was received by the Delhi fire services at 9.25 am and six fire tenders were rushed to the spot. The injured have been rushed to Deep Chand Bandhu Hospital. Two teams of the National Disaster Response Force (NDRF) have also been mobilised for the rescue operation. 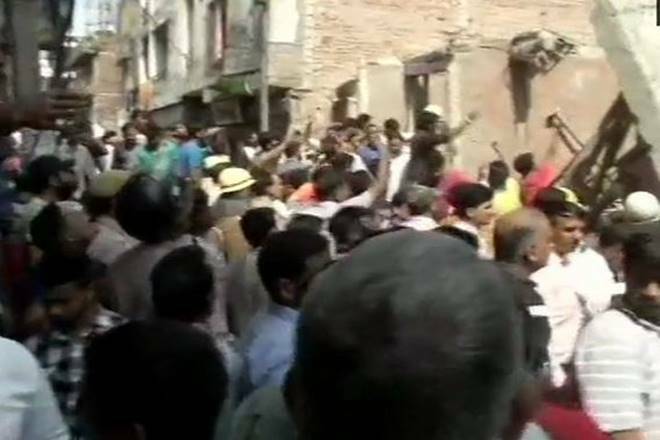 In July this year, two under-construction buildings were collapsed in Shah Beri village of Greater Noida in the Gautam Budh Nagar district of Uttar Pradesh. He tweeted, "Visited #DeepChandBandhuHospital, where the victims of #BuildingCollapse at Sawan Park, in Ashok Vihar were admitted. Inquired from doctors of the hospital the condition of the injured; none of them are critical. Also met the injured - 3 men and a girl. Union Minister Dr Harsh Vardhan visited the area in Ashok Vihar where the building collapse mishap happebnedaerlier today. He tweeted "Rushed to the site of #BuildingCollapse in Ashok Vihar area. 5 people were reported killed, while several others injured. The injured were rushed to Deep Chand Bandhu Hosp. #NDRF teams have been mobilised for rescue, besides officials of civic agencies." Delhi govt orders magisterial probe, will compensate the victims of the building mishap. Delhi CM reached Deepchand Bandhu Hospital to meet Ashok Vihar Phase 3 building collapse victims. Locals claimed that along with the building, a Shisham tree, adjacent to the building, also collapsed. "I saw the building collapse like a pack of cards"
Vimlesh, who was present at the hospital and whose family members were injured in the collapse, told PTI, "As soon as I left home and had barely walked a few metres, I heard a loud noise and when I turned back, I saw the building collapse like a pack of cards. I am waiting to hear about the condition of my family members. Two of my daughters had left home in the morning." The fourth floor was inhabited by a couple, Narottam and Nisha. Nisha is reportedly critical. Two families were living on the third floor. One of the deceased woman, Munni, was living in one of the houses on the third floor. The second family living on that floor lost its children -- a boy and his sister aged below five. The ground floor of the building housed a shop, which was closed while the first floor was vacant, PTI reported. A family lived on the second floor of the building. Two of the children, who were killed in the incident were brothers, aged around 10 years, and lived on the second floor. A senior North Delhi Municipal Corporation official told PTI that the building was about 20 years old. Its structure was weak and in a deteriorated condition. Four children and a woman died after a three-storey building collapsed in Ashok Vihar Phase 3 . Search and rescue operation underway. Two children were killed and at least nine others injured after a three-storey building collapsed in northwest Delhi's Ashok Vihar Wednesday, police said.